Galaxy Note 9 One UI (Pie) beta program registration open in the US! Here it comes, folks. Samsung has opened up the One UI (Android Pie) beta program to Galaxy Note 9 owners in the US. Before you get excited, let’s just say that the company is now allowing users of the unlocked model to register for the beta. The actual update is yet to start rolling out, although that should change soon enough. According to XDA Developers, the signup process is available for Sprint and Verizon users using an unlocked Galaxy Note 9. The registration process remains the same as the Galaxy S9’s. Just open the Samsung+ app and you should see a banner saying “One UI with Android 9.0 on Galaxy Note9.” Click on it, then tap the register option. Naturally, you will have to be logged in to your Samsung account for this. Slots will be limited as usual, so don’t delay if you want to test One UI and Android Pie ahead of its official release next year. What is happening with all the promised ar emojis updates that were have to been available for the Note 9. I have seen nothing since the phone came out. Please advise. Thank you. When It’s Coming for Note 9 India?? Not seeing it. A US VZ user with Unlocked Note 9. I’m wondering the same as well. I saw that is was available for Sprint Note 9s. Yea I got Sprint nothing yet. I’ve tried reinstalling the app and clearing data and all that. Hopefully it wasn’t just for last night but we will see as the day goes on. Wow! 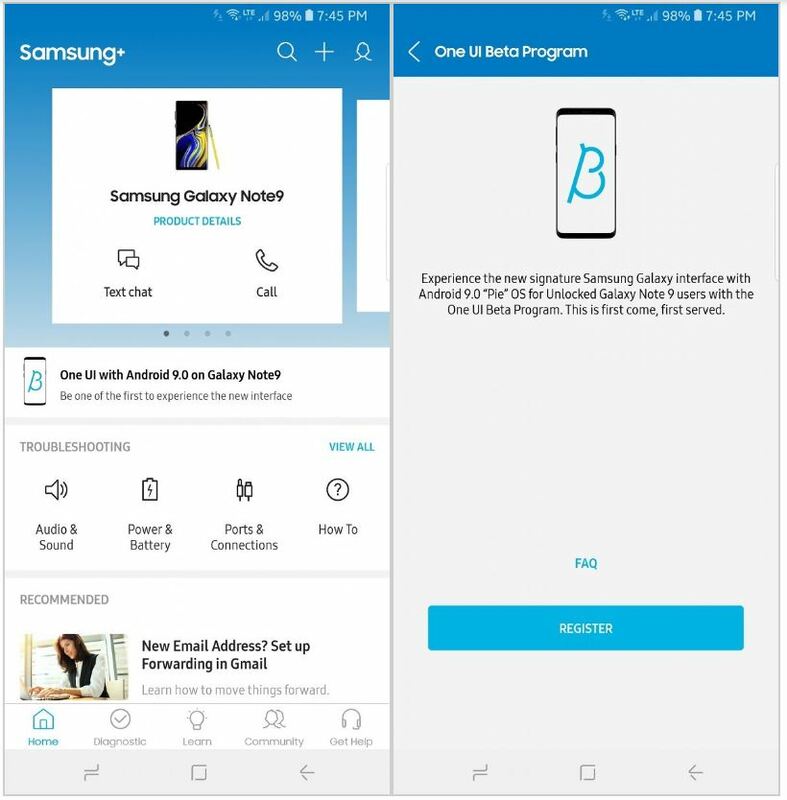 First Galaxy Note to get beta program? Liar! Beta program is only for s9 and s9+ not for Galaxy Note 9…Why u talk if u don’t know. Yes in USA…He said in UK. US is in phase one or two for S9/S9+ ? Great news!!! Samsung, where is S9/S9+ Beta for UK!!!??? ?